The Nevada Cast Aluminum Outdoor Patio Dining Chairs by Coastlink Furniture is a set of two elegant, heavy-duty, generously-sized armchairs featuring premium Sunbrella cushions — which are perfect for outdoor dining when paired with a table, great for parties when multiple sets are arranged in a circle, and relaxing to curl up in with a good book, and enjoy the sunshine in your garden. Made with solid, durable, weather-resistant cast aluminum, which is a non-ferrous metal that *will not rust*, the Nevada Cast Aluminum Outdoor Patio Dining Chairs measure 22-inches wide by 23-inches deep by 36-inches high, and are built to withstand the outdoor elements — for many years of outdoor dining, conversation, entertaining and enjoyment ahead. 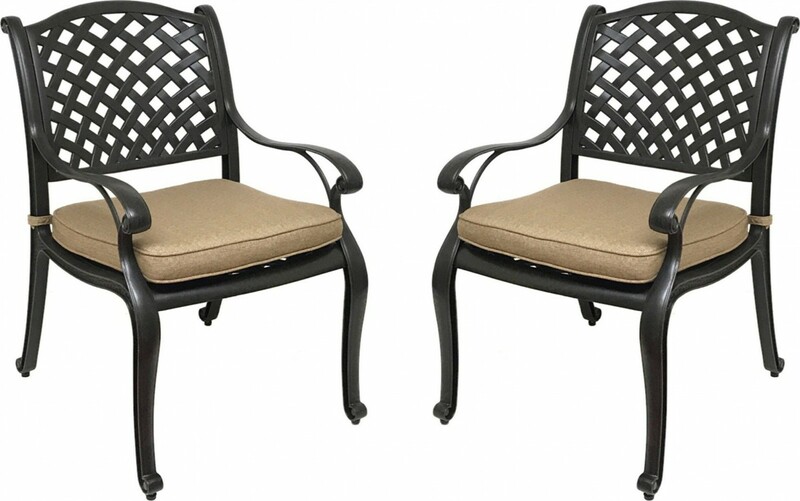 Featuring a multi-step, weather-resistant, hand-finish in Antique Bronze, which is dark bronze in color, with a hint of copper for warmth and richness, the Nevada Cast Aluminum Outdoor Patio Dining Chairs with Sunbrella Cushions is an elegant seating set with a sturdy weight, and will add a touch of sophistication to your outdoor space that you’ll enjoy for years to come. Designed with a beautiful latticework pattern, which is reminiscent of fresh, flowing blades of grass in a field, the Nevada Cast Aluminum Outdoor Patio Dining Chairs with Sunbrella Cushions is also very practical in that it lets water fall through its surfaces (instead of pooling) — which results in faster drying time, so they’re back in action soon after a rain. 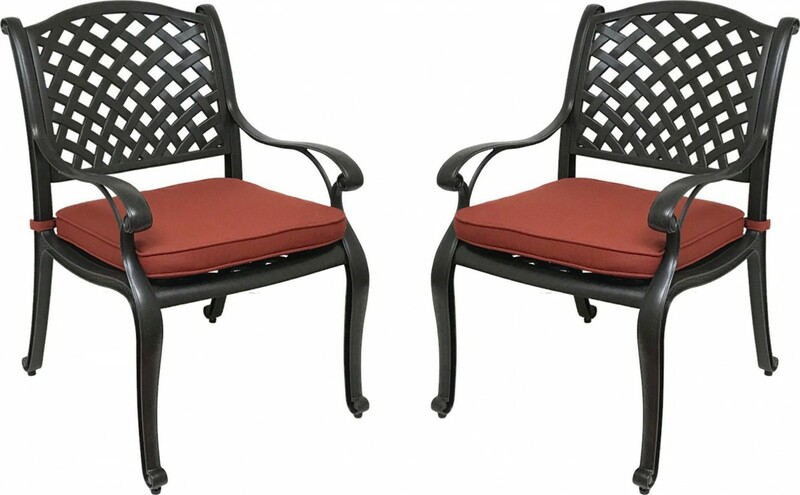 Featuring premium, removable, Sunbrella fabric on the two included cushions, which is mold and mildew-resistant, UV and fade-resistant, and provides unparalleled durability and weather-resistance, the Nevada Cast Aluminum Outdoor Patio Dining Chairs also come with two fabric color options — a bold scarlet, and a neutral sesame color — to suit your taste and outdoor space. Simple and easy to maintain thanks to its premium, easy-care materials, the Nevada Cast Aluminum Outdoor Patio Dining Chairs with Sunbrella Cushions simply requires a wash-down with your garden hose each month — to prevent dirt from becoming ingrained in the fabric, or baked onto the aluminum — and they’re otherwise ready to enjoy whenever the sun’s shining. 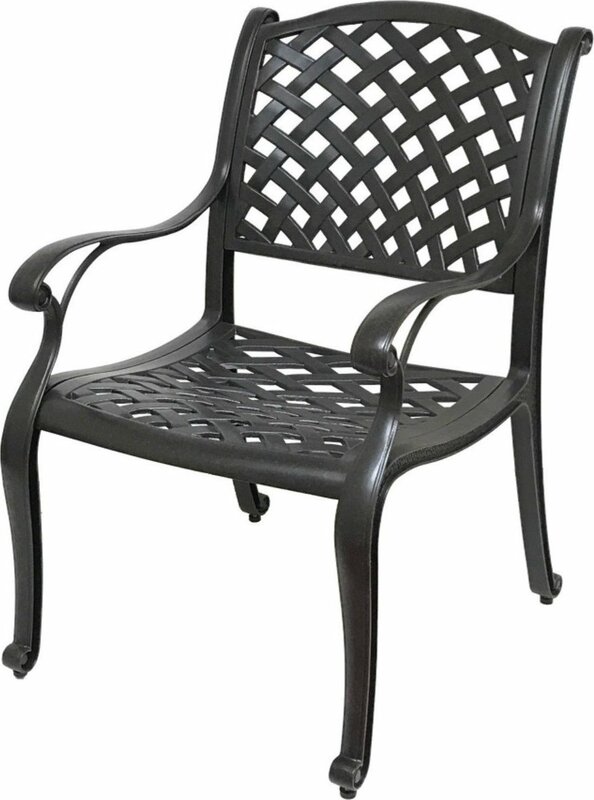 Including an adjustable glider under each chair leg, which serves to level out any wobbles on uneven surfaces, and also to protect your patio surfaces from scratches or marks, the Nevada Cast Aluminum Outdoor Patio Dining Chairs with Sunbrella Cushions will make a comfortable and elegant addition to your outdoor space — either as extra seating, or primary seating around an existing table. With simple, easy assembly, and arriving exceptionally well-packaged to protect the chairs during shipping, the Nevada Cast Aluminum Outdoor Patio Dining Chairs are sold in sets of 2 (so you can easily order as many as you require) and are available over at Amazon.com (rated 4.8 out of 5 stars from 11 customer reviews) with FREE shipping. Click to see current price.